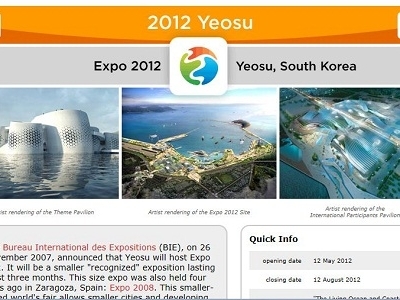 The Bureau International des Expositions (BIE), on 26 November 2007, announced that Yeosu will host Expo 2012. It will be a smaller "recognized" exposition lasting just three months. This size expo was also held four years ago in Zaragoza, Spain: Expo 2008. This smaller-sized world's fair allows smaller cities and developing nations to host an event. The larger-sized expos, known as "sanctioned" expos, are held in years ending in "0" and "5."